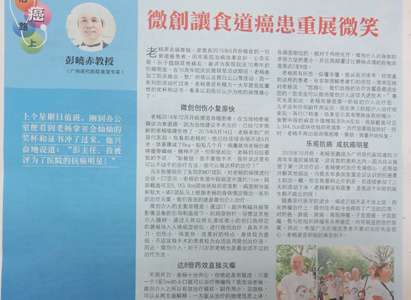 On November 18th, 2015, Malaysia Guang Ming Daily published a special report, which tells the anticancer story of esophagus cancer patient YONG AH SANG. Since December 2014, YONG AH SANG has been suffered from dysphagia, and he was diagnosed with esophagus cancer after taking examinations in the local hospital of Malaysia. Considering his old age of 72 years old, YONG AH SANG refused doctor’s suggestion of chemotherapy. Later, his son got to know Modern Cancer Hospital Guangzhou via internet and newspaper. After thinking twice, YONG AH SANG decided to take cancer treatment in China. On June 14th 2015, with the company of his family, YONG AH SANG came to Modern Cancer Hospital Guangzhou. At that time, he has been suffered from dysphagia for 6 months; he lost weight by 6kg and was in low spirit. After hospitalization, the MDT (Multidisciplinary Team) of Modern Cancer Hospital Guangzhou specially made him a therapeutic plan based on interventional therapy. Interventional therapy is a mini-invasive therapy performed under the guidance of medical imaging equipments. With a 1-2 millimeter incision, paracentesis could be performed with the lead of medical imaging equipment. Then a special tube, catheter or other sophisticated apparatus are introduced into human body to diagnose and treat the lesion, so as to cut off the cancer’s blood supply. Knowing that there was no need to take operation, YONG AH SANG was very happy but still in doubt. Can cancer really be treated with a 1-2mm incision? With 30 years of medical experiences, Director Peng explained to YONG AH SANG that interventional therapy directly give medicine to the diseased region and tumor issue, so as to make sure that the medicine directly kill cancer cells, the drug concentration is 2-8 times higher than local radiotherapy and intravenous drip. After the first session of interventional therapy, YONG AH SANG almost suffered from no side effects. After three session of interventional therapy, the result of CT scan showed that the length of diseased esophagus has shortened from 11cm to 9cm, the local cross session area has shrank from 5.1*3.9cm to 3.3*4.5cm. Moreover, YONG AH SANG’s swallowing function returned to normal, his appetite became good and his weight increased. Although YONG AN SANG is 72 years old now, he is never defeated by age and disease. He took part in not only the evening party of the 10th anniversary of Modern Cancer Hospital Guangzhou, but also the activity of climbing Baiyun Mountain and Canton Tower. On October 2015, YONG AH SANG was honored as the Anticancer Warrior of the 10th Anniversary of Modern Cancer Hospital Guangzhou. With the development of Modern Cancer Hospital Guangzhou, cancer is no longer a kind of incurable disease. Minimally invasive therapy now is widely used in various kinds of cancer treatments, like liver cancer, lung cancer, colorectal cancer, breast cancer, etc. YONG AH SANG’s anticancer experience tells people that cancer is not incurable disease, cancer patients should have confidence to look for better treatment and defeat cancer.